New video series “Make intelligent ERP tangible” out now! The intelligent ERP and especially machine learning as enabler of intelligent applications have recently been subject to unprecedented attention. 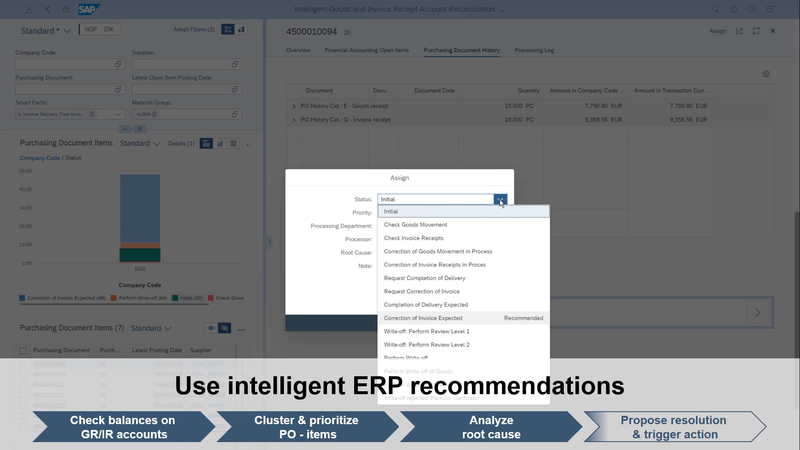 An intelligent ERP is expected to take enterprise applications to the next level. But what does this mean in practice? What does an intelligent enterprise application look like and what are the actual benefits from using it? Each video starts with an intro that describes a well-known business problem context, typical users can identify with. The major pain-points are highlighted to stress the value, a potential solution that leverages machine learning could offer. The central part of each video is a live demo showing a consistent process flow and how machine learning is used to make it more reliable and efficient. The demo is augmented by a graphical representation of the process flow and pop-ups pointing out intelligent highlights in the moment, they are visible. All demos start with a cockpit view, where an analysis is kicked-off, before an appropriate action is taken with the support of machine learning. The outro summarizes the solution benefits and highlights the main improvements, whereby the value of machine learning is emphasized again. With the first video, a common problem from the area of finance is covered: Although, the matching of goods receipts and invoice receipts is done automatically, the reconciliation of exceptions requires extensive manual work and significantly reduces the efficiency of financial closes. The video shows, how a new app leverages machine learning to improve this process. A comprehensive overview of the current situation kicks off the process, before the superior analytical capabilities of SAP S/4HANA and the special criterion of Smart Facts are used to prioritize efforts. A view, especially created for the efficient investigation of a single exception, prepares the decision on the best next steps for an efficient reconciliation. Leveraging machine learning recommendations, the decision is finally made and SAP CoPilot is introduced as a powerful tool for the resulting follow-up activities. Predict arrival of Stock in Transit describes a supply chain topic: In case of material delivery delays, a stock transfer from another plant is often the best option to prevent delayed customer delivery on short notice, but only if the transfer can be executed on time. The video explains, how SAP S/4HANA uses machine learning to predict if a transfer is advantageous, before it is finally executed. A comprehensive inventory management overview and an intuitive warehouse reporting, where reports can be built on the fly via drag and drop enable unprecedented transparency when it comes to inventory decisions. 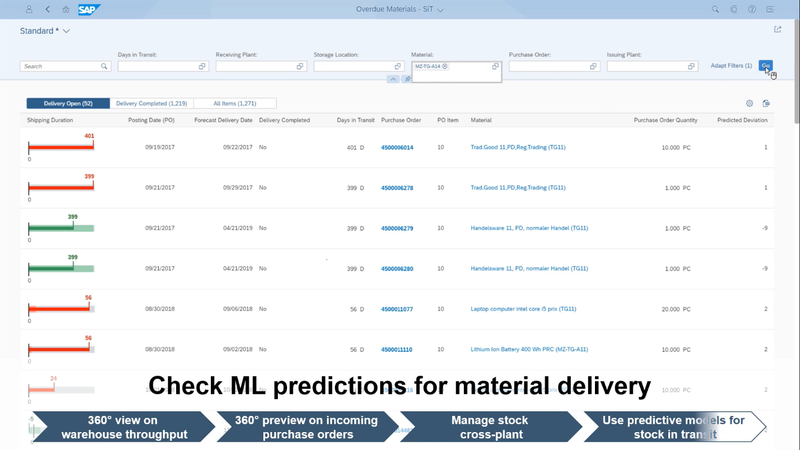 Using a view on the status of incoming purchase orders, a need for action is identified and potential sourcing options from other plants are evaluated. A machine learning model helps to check, if a transfer from another plant would be beneficial in terms of the delivery duration. The created transport order is continuously monitored then. The same applies to the quality of the machine learning predictions, which is regularly evaluated through a separate app. Strategic purchasers are familiar with the problem of non-managed spend, a common inefficiency in procurement: By sourcing materials without a purchase contract, potential discounts that would result from negotiations or scaling are not fully exhausted. But the identification of materials suitable for contracting tends to require extensive manual effort. The video introduces an app that leverages machine learning to propose those materials, where a sourcing contract would be beneficial. Starting from a 360-degree procurement overview, open purchase requisitions are selected for investigation. A list with several purchase requisitions from the same material indicates that contracted sourcing potentially provides scaling advantages. The new app is used to verify this assumption. 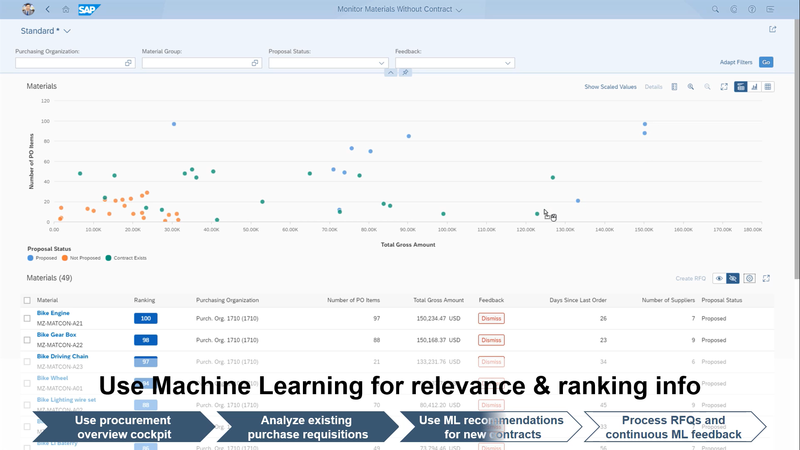 In a hybrid view, the proposed materials are shown on a graph that highlights its importance in terms of amount and order value and in form of a machine learning enabled ranking that indicates the suitability of each material for contracting. A detailed view additionally informs about the parameters influencing the ranking. For a material with a high ranking, the request for quotation can be created immediately out of the app. The user can influence the ranking by dismissing proposals, a valuable feedback, the algorithm can learn from. The video examples provide a first impression of the manifold applications of machine learning. Not only the technology itself comes in a variety of shapes like recommendation, prediction or ranking, but also the areas of application seem to be unlimited. What tends to be an abstract concept at a first glance provides tangible and valuable outputs, even in the distinct area of ERP systems. Drawing from this, the intelligent ERP is a must have for businesses to leverage machine learning right now and to be prepared for the future potential of this technology. See for yourself and watch the videos from the areas of Finance, Supply Chain and Procurement now! See also a more detailed view on the Goods Receipt and Invoice Receipt Reconciliation and feel free to share and use this blog and/or the videos!